Here it is! 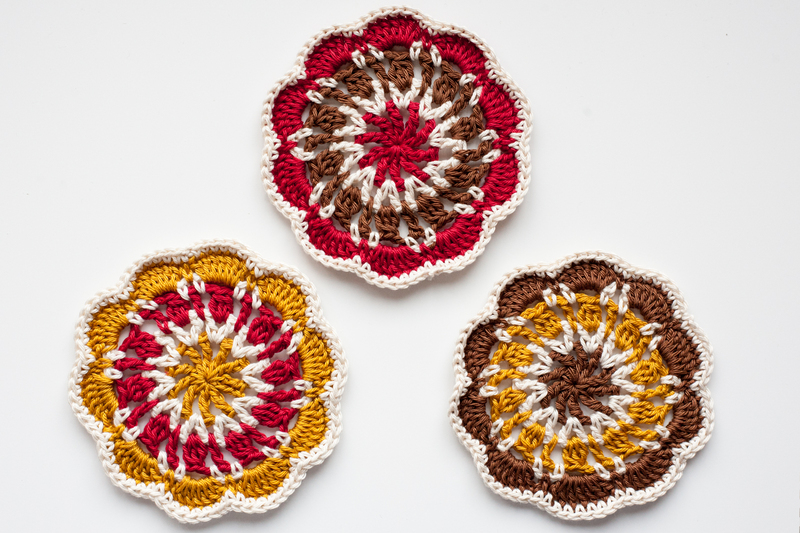 The cosy coaster crochet pattern! 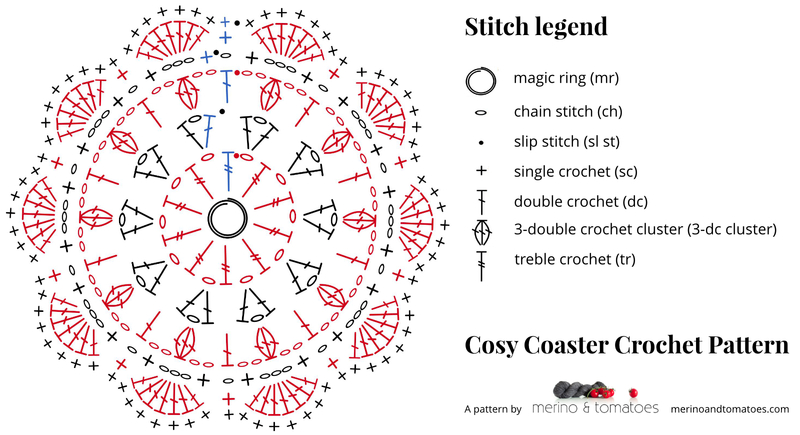 Below you will find all details required to make as many cosy coasters as you like. There is a written pattern as well as a pattern chart. Have fun and please share your creations! For the coaster pictured in the step-by-step tutorial the colours A, B and C are used. A pair of scissors and a needle to darn in the yarn ends. The coaster is worked in the round and the finished coaster has a circular shape. At the widest point, the coaster has a diameter of 12 cm. Gauge is not critical for this pattern. You can make them as small or large as you like. 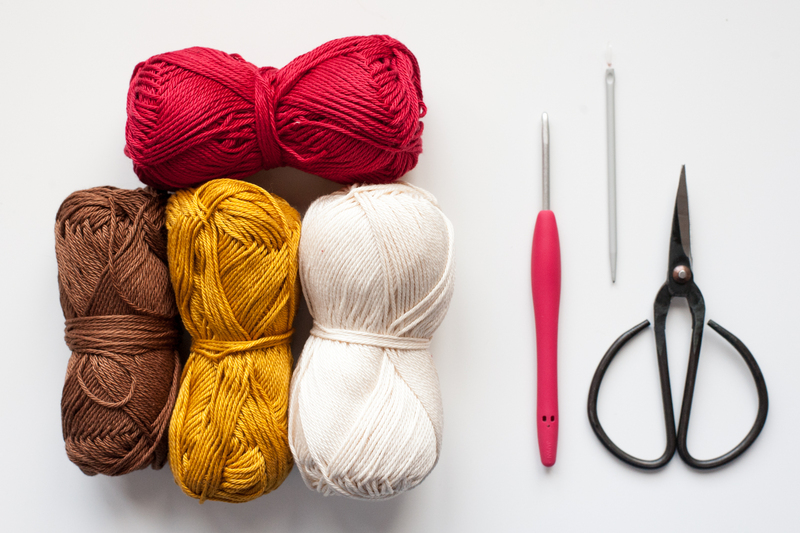 Just make sure that you use a hook that matches the weight of your yarn should you decide to use a different yarn. The written pattern and pattern chart (at the end of this page) use US stitch terms. Of course, you can use your own preferred way to join a new colour! All steps are illustrated by step-by-step photos. You will find a pattern chart at the end of this page. Make a magic ring using yarn B. Continue to use this yarn for round 1. Round 1: make 4 ch in the ring (counts as 1 tr + 1 ch), *1 tr, 1ch. Repeat from * 8 times. Close round with a sl st in the 3rd ch. Break yarn. Round 2: join yarn A using a standing dc in any of the ch-sp, ch, dc, *in the next ch-sp: dc, ch, dc. Repeat from * 8 times. Close round with a sl st in the first st. Break yarn. Round 3: join yarn C using a standing dc in between 2 dc of the previous round (indicated in the photo above), ch 2, 3-dc cluster in the next ch-sp, ch2, *dc, ch 2, 3-dc cluster in ch-sp, ch 2. Repeat from * 8 times. Close round with a sl st in the first st. Break yarn. Round 4: join yarn A using a standing sc in any of the ch2-sp between dc and cluster of previous round, ch 3, sc in next ch2-sp, ch, *sc in next ch2-sp, ch 3, sc in next ch2-sp, ch. Repeat from * 8 times. Close round with a sl st in the first st. Break yarn. Round 5: join yarn B using a standing sc in any of the ch-sp of the previous round (indicated in the photo above), 7 dc in the following ch3-sp, *sc in the next ch-sp, 7 dc in the following ch3-sp. Repeat from * 8 times. Close round with a sl st in the first st. Break yarn. Round 6: join yarn A using a standing sc in any of the stitches of the previous round. Make 1 sc in each stitch. Close round with a sl st in the first st. Break yarn. Weave in all yarn ends and start another one! The first stitch of each round is indicated in blue in the chart below. 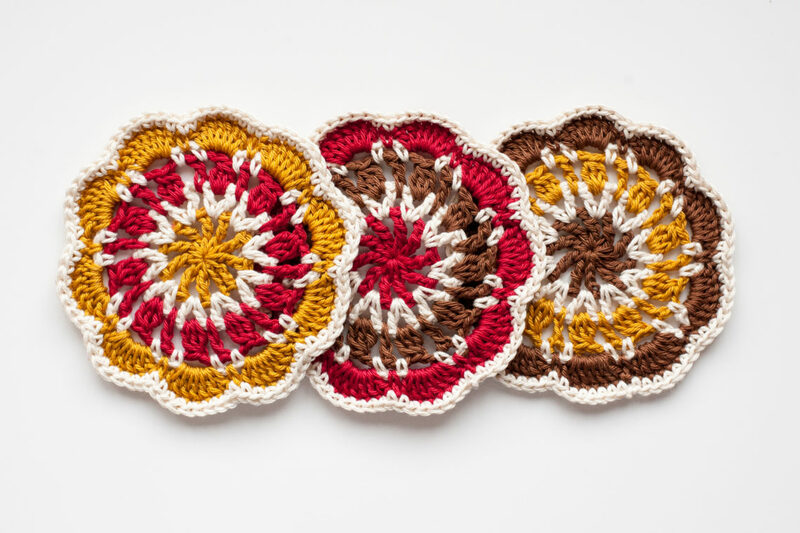 I’d love to see your cosy coasters and I am curious which colour combinations you use! Please share your finished coaters on social media using #cosycoaster and #merinoandtomatoes. Thank you! This pattern is copyright protected, read more here.